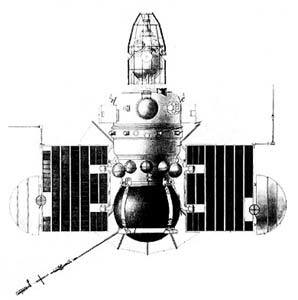 The 2MV-1 type was a soviet Venera-type spacecraft intended to make a landing on Venus. Molniya launcher put the spacecraft 2MV-1 #1 (dubbed Sputnik 19) into Earth orbit, but the escape stage failed and the probe remained in geocentric orbit for three days until the orbit decayed on 28 August and it re-entered Earth's atmosphere. The 2MV-1 #2 (dubbed Sputnik 20) spacecraft was successfully inserted into geocentric orbit by the Molniya launcher. The escape stage failed and the spacecraft was stranded in Earth orbit until it re-entered the Earth's atmosphere 5 days later. In the same launch window, a also unsuccessful 2MV-2 venus fly-by spacecraft was launched.